Systems like the BodyCraft F430 Power Rack provide a safe basic platform for any at-home exercise program. With just the rack your exercise choices will be limited; so you will need to also buy a bar, weight plates, and a bench. There are a few additional attachments you may consider worthwhile, but are not strictly necessary. This power cage is reassuringly solid; made with 11 gauge steel, thick ½” bolts, corner gussets, and a weight of 280 pounds. It is also fairly spacious with dimensions of 48.9”W x 51.5”L x 82.5”H. Some sticking points are its cost ($800) and its assembly, which is somewhat involved. The BodyCraft F430 Power Rack is a solid rack with several features that make it well-liked among its owners. First and foremost, it comes with free shipping to your house in the continental US. BodyCraft offers a lifetime warranty for their rack, which is the confidence they show in their product’s ability to stand up to the abuse from weightlifting. Its adjustable safeties can easily be raised or lowered to a comfortable height for squatting or benching. The safeties are rated at 800 pounds though one reviewer stated that the company tested it with 1200 pounds without issue. Spring pins make adjusting the safeties and the j-hooks (the part of the rack you start a lift from) a quick and simple matter. The rack itself is spacious, easily allowing you to maneuver a bench into position and room to complete lifts. It is only 82 inches high, fitting into most homes, though you will want to add some head room to perform pull-ups on the included bar. The chin-up bar is just a simple straight bar, which some users found made it simpler to attach gymnastic rings to. Although exercise choices with just a power rack are limited, there are many attachments that expand those choices to make the BodyCraft F430 a complete gym. For additional chest work there are dip attachments and for back work there are lat attachments. The attachments are solidly made specifically for this rack and the rack is designed with these attachments in mind. Additional hooks are available which will come in handy if you want to do overhead work like pressing. The BodyCraft has a few issues. First the rack is not cheap. It is sold on Amazon for $800, and that doesn’t include the attachments or other equipment you will need to perform most exercises. This is more than double that of other racks available with a comparable design. Most reviewers felt that the price reflects a premium commiserate with the solid construction of the rack. Secondly, the rack is not simple to assemble. It is heavy and it has many pieces. To get the most out of the rack you also have to secure it to the floor, but that is not unique to the BodyCraft rack. Attaching any rack to the floor requires drilling a hole in concrete which takes specific tools. Third, the hooks on the rack are not rounded which affects your ability to bench press with proper form. The hooks can’t be moved from front to back, only up and down. This is by design since the hooks slide over the entire support post meaning they could not be removed or rotated without disassembling the rack. The issues with the BodyCraft F430 power rack are not so significant that they outweigh the positives of the rack. The cost comes from the solid construction and is largely offset by the free shipping which is a significant value in its own right. It is hard to assemble due to its weight and parts, but there are clear instructions and most of the bolts are interchangeable. You can buy a second pair of hooks or just leave them on the back support post and you will never need to worry about being unable to move them front to back. The design of the hooks is not a large issue either as the matter of form is easily compensated for. 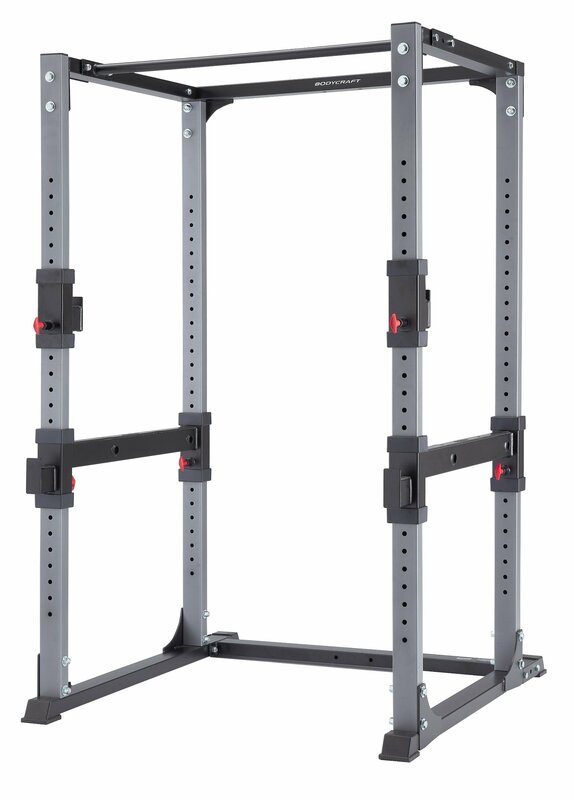 Overall the rack is a solid purchase for any home gym where your safety and comfort in completing a wide variety of weighted exercises is your main concern.